Hey! Thanks for stopping by! 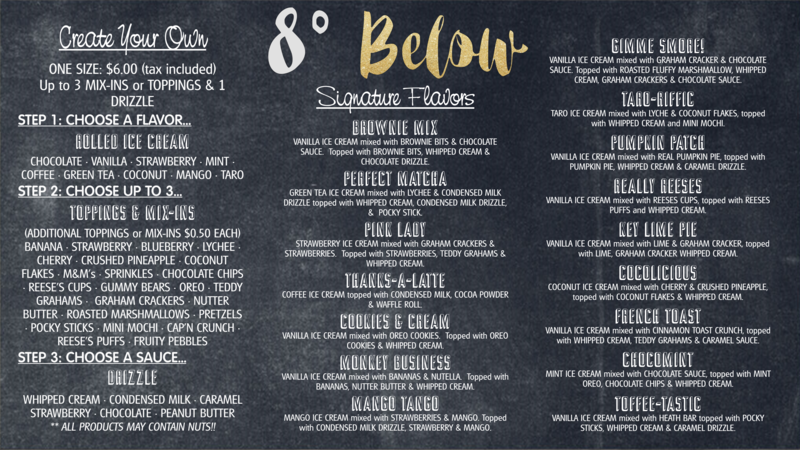 We’re 8° Below, makers of the amazingly delicious rolled ice cream! We use only the highest quality natural ingredients and create every bowl from scratch right in front of you! Come visit us at our BRAND NEW LOCATION! We’re now open and rolling it out cold at 1821 E. Madison Ave. , in the Spring Creek Shopping Center! At 8° Below, we have an exciting way of making our unique rolled ice cream. You can pick from one of our delicious signature selections, or make something uniquely yours! Once you’ve made your selections, we pour all of the ingredients together onto a flat pan, chilled to as low as -8° (that’s how we got our name). Next, we chop your mix-ins and cream together and then roll them into their signature shape, ready for your enjoyment! To finish, we add toppings or one of our delicious drizzles! Come visit us at our BRAND NEW LOCATION! We’re now open and rolling it out cold at 1821 E. Madison Ave. , in the Spring Creek Shopping Center!